CUTOUT: A third person used to conceal the contact between two people. A pawn. They were partners — lovers in a business where betrayal is a heartbeat away. 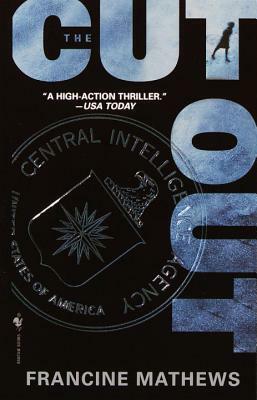 CIA analyst Caroline Carmichael lost her husband Eric when his plane was blown out of the sky by an elite group of terrorists known as 30 April. Now her dead husband has surfaced among those responsible for an explosion that rocks Berlin — and the brutal kidnapping of the U.S. Vice President. Uncertain of Eric’s motives and loyalties, the Agency plays its last, best card: Eric’s wife — the Cutout. Is Eric a rogue agent gone bad? Or has he thrown himself under deep cover to terminate a ruthless psychopath? Caroline is drawn into a dizzying maze where one wrong turn will mean certain death ... and in which the Cutout will be the first to fall. Francine Mathews spent four years as an intelligence analyst at the CIA, where she trained in operations and worked briefly on the investigation into the 1988 bombing of Pan Am flight 103. A former journalist, she lives and writes in Colorado, where she is at work on her next suspense novel, The Secret Agent.